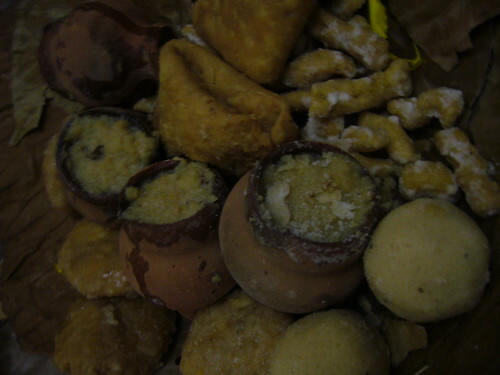 Last Saturday was Krsna Rasayatra and the last day of Kartik. 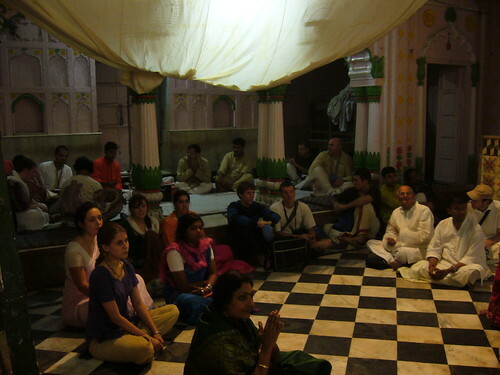 I was remembering the first day of Kartik, and the amazing experience I had that first night in Vrindavan. 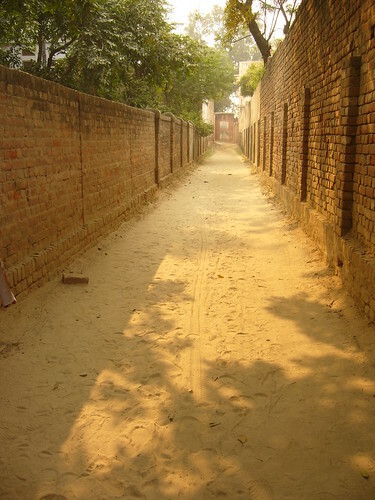 Many of us had heard that there was to be a special ‘moonlit’ darshan of Sri Radha Raman that evening, so piling into an auto rickshaw, we bumped and bounced all the way there, barreling down the dark alleyways, finally pulling up outside the temple gate. The temple room was an amazing sight. 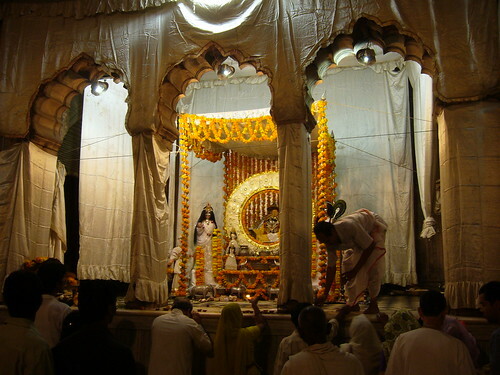 I had been to the Radha Raman temple two days previously, but now it was completely transformed.The altar, walls and ceiling were covered in white silk; incense filled the air and lamps burned all around. 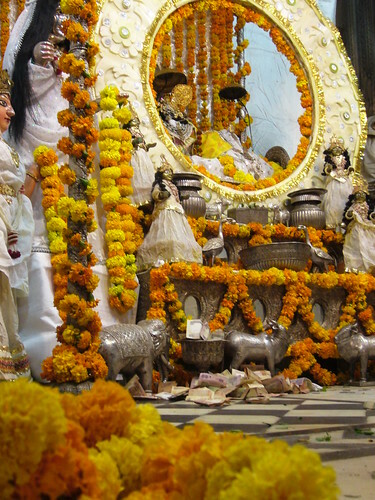 On the altar, the beautiful deity of Sri Krsna stood, surrounded by a giant white moon and gopis on either side, offering flowers and other items of worship. At his feet sat silver cows, elephants and peacocks. Bright garlands of marigolds hung from above and were entwined around pillars. The temple room was practically empty and from the back of the temple room, one of the goswamis sang sweetly, his voice infusing the room with devotion. 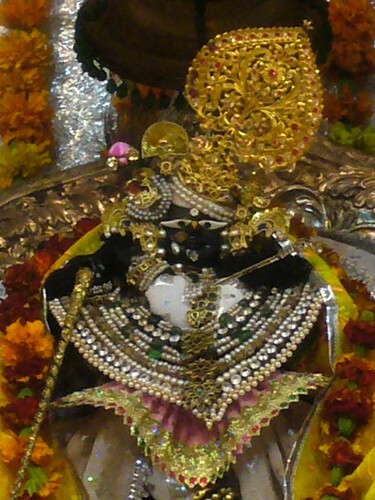 Even standing far away, you could see the lotus eyes of Lord Krsna – in that moment he was there, surrounded by the gopis in the moonlight, his crown tilted to one side, jewelled necklaces hanging to his waist. 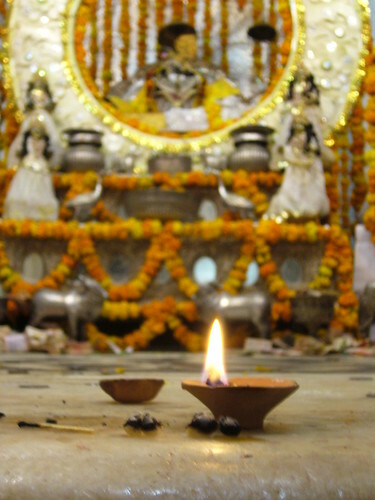 That night was also Krsna Saradiya Rasayatra, the night of the autumnal rasa dance. 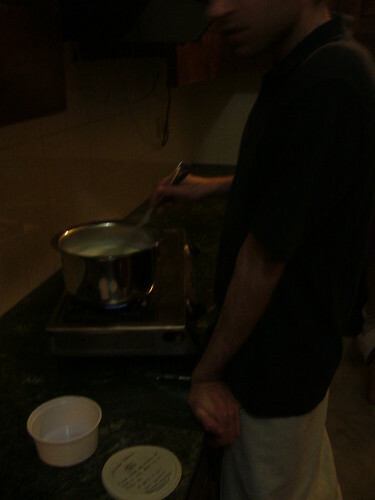 When we got home from the temple, we cooked sweet rice for Krsna and the gopis to eat later on, stirring for and hour as the milk lowered and thickened. We wrote prayers on a pot and put it outside (with a monkey proof brick on top). 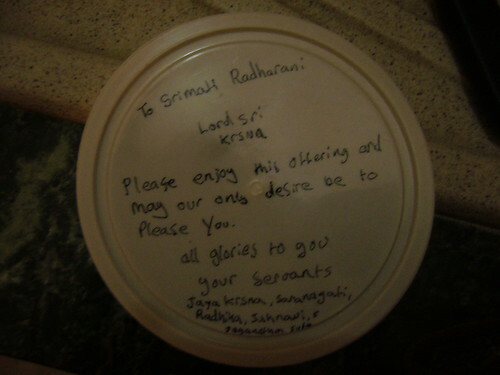 This Saturday, now far from Vraja, I returned home late from a wedding and again made sweet rice, remembering that wonderful night and thanking Krsna for the amazing experiences I had this Kartik, as it now drew to a close. I just wanted to say thankyou to everyone that reads what I’ve been writing. I appreciate your comments and support so much and I hope that you will forgive me for being a self centred writer most of the time. I have been worrying about writing this blog lately. I sometimes wonder who I’m actually writing for and whether my writing is serving any purpose. As an exercise in working my literary muscles, it has been effective, and a great outlet, but the more I post, the more I feel that I do cater to what I know people will want to read. Nice pictures, sweet words, poetry and other sugary confections. But I don’t want flowery words to decorate an empty heart. I read a review of a book by Jayadwaita Swami in which he said the author had thankfully, not written in ‘Gaudiya purple’. I thought that was a great expression; it reminded me how easy it is to become sentimental though. I’m trying not to be just a nectar seeker. You can eat the sweets as much as you want, but without the proper grains and vegetables of service and sadhana, you won’t be healthy. So please bear with me as I improve my writing. Thankyou to all my fellow bloggers who inspire me with their wonderful writing: Vyenkatta Bhatta, Gauranga Kishore, Bhakti, Manu, Madhava Ghosh, Bhakta Eric, Vishaka, Rishi, my Dad and many more…. “Every one of you. What is your realization? You write your realization – what you have realized about Krishna. That is required. It is not passive. Always you should be active. Whenever you find time, write. Never mind – two lines, four lines, but you write your realizations. Sravanam, kirtanam. Today was the funeral of Sanjaya prabhu, who passed away nine days ago. It was a very sad event, but also wonderful to see so many devotees in our community come together to pay their respects and honour such a dedicated devotee. Flower offerings in the shape of swans, lotuses and Bhagavatams were placed on the coffin, and everyone chanted the Govindam prayers as his body was taken away for cremation. I felt extremely moved by the whole event for so many reasons. I think death is such a complex thing – it draws out such a range of emotions and thoughts that go far beyond the present moment. I feel so sad for Sanjaya’s family, who have lost a wonderful husband and father but who are displaying such strength and courage in his absence. 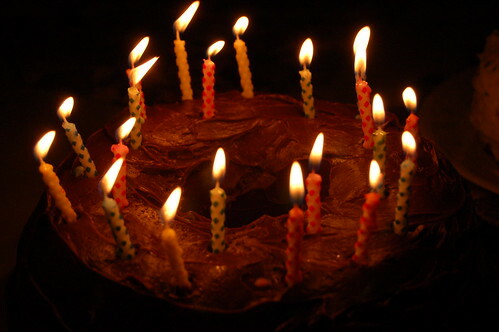 Simultaneously, I feel so grateful that my own father recovered from his illness so recently – it was just on my birthday last year that he was going into the operating theatre. I also feel such love and gratitude for all that the senior devotees of ISKCON have done to create the thriving society that we inhabit today. I feel sorry that I don’t seek their advice and instruction very often. Sanjaya prabhu was a renowned book distributor amongst other things – how much knowledge could he have passed on if I’d asked him? As the years pass, every new brush with death gives me new realisations. I have been so blind in the past, but with the passing of every wonderful devotee, my eyes are being opened to the fact that I have to take advantage of the association of the incredible Vaisnavas around me. 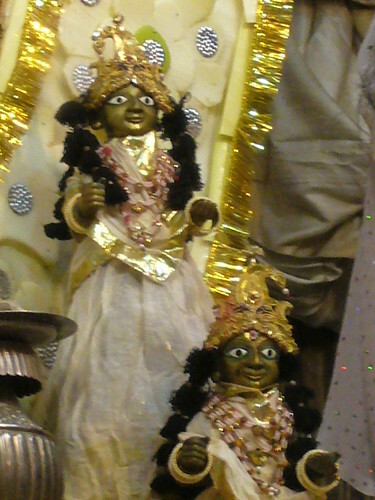 Sridhar Maharaj, Tamal Krishna Maharaj, Bhakti Svarupa Damodar Maharaj, Bhakti Tirtha Swami, Tribhuvannatha prabhu, Sanjaya prabhu – the list grows longer every year. I have read about the passing of Nirguna prabhu in Mayapur, and I can only put my head at his feet, and pray to follow his example one day. It is a sobering thought to think that my generation will witness the passing of every single Prabhupada disciple. Maybe it’s a symptom of my youth that this seems so daunting – as adults, do we become more used to the idea of death? Yes or no, it will happen, and today I truly realised that it is a serious matter. On the youth bus tours, Manu prabhu always tells us that we are ‘the future of ISKCON’ – and we know it’s true – albeit in some hazy, distant future. But that future is becoming clearer and closer than ever and I feel that I have to reflect this in my life in a very significant way. I pray to you today, that I may have one speck of your devotion to Lord Krsna and Srila Prabhupada. Please help me to understand the seriousness of this mission and give me the strength to really do something. The safest place to be in all the three worlds is at the feet of a Vaisnava – please hold me at your feet and give me the humility and surrender to sincerely fall at the feet of all that surround me. 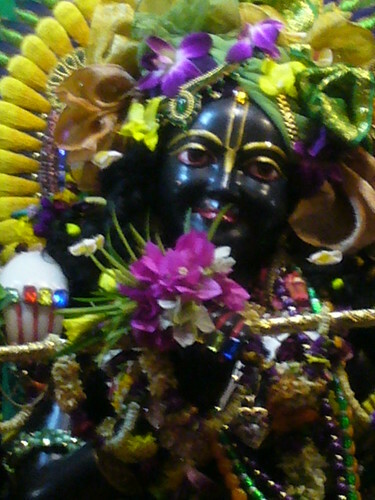 Please bless me with the wisdom to see opportunities for serving Krsna everywhere, and to be interested in nothing else. Last week, the day after we heard about Sanjaya prabhu, my creative writing tutor asked us to re-write a well known poem. In class we had been reading the famous W.H. Auden poem about death -‘Stop All The Clocks’. Reading this, I was reflecting on how negative the experience of death was being presented and thinking about our view of death as devotees. I wrote this poem – it’s not really finished but I wanted to share it anyway. The original Auden poem is below. Let the drums and cymbals be heard all around. Run now, run to his waiting embrace! 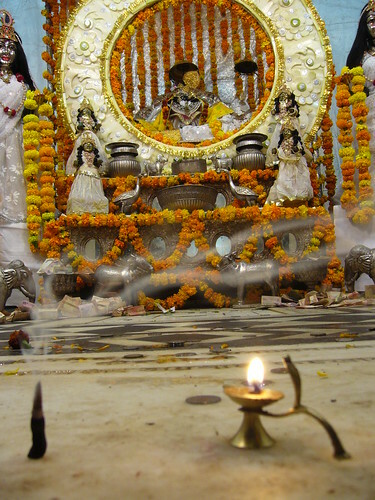 The evening I left Vrindavan, I rushed to see the deities and offer my final Kartik lamp, then went to Srila Prabhupada’s samadhi for the last time. I stood in front of his giant golden murti, looking at his sober expression and saying a silent prayer for something undefined, when some words appeared in my head. ‘Take Krsna consciousness seriously. Every day is Krsna.’ I don’t know who said it. Maybe I was remembering the time many years ago when my Dad showed me his favourite picture of Srila Prabhupada. I couldn’t understand why that was his favourite – Prabhupada wasn’t even smiling. But he told me his serious expression reminded him that we have to be determined to follow his instructions if we are to become real devotees of Krsna. I took it as good advice. Krsna conciousness is serious. In our natural state, everyday is Krsna. Our only thoughts, words and actions are of how best to serve him. I feel a bit lost for words. At university this week I have been sitting through my lectures, trying to pay attention, but mostly failing. I’m beginning to realise that maybe coming back to England is not the end of the experience, but the second part of the blessing. Feeling separation from Vrindavan draws me closer to Krsna in my mind and helps me to understand that being in Vrindavan physically is not always the most important thing. To be there mentally, to be thinking of serving Krsna and his devotees always – I think that’s what it means to really be in Vrindavan.